Beautifully engraved Certificate from the Cincinnati and Suburban Bell Telephone Company (Cincinnati Bell)issued in 1969 - 1985. This security is a 10 8 3/4% debenture that was due in 2009. This historic document was printed by the American Banknote Company and has an ornate block border with a vignette of a woman talking on a early puch button phone. This item has the printed signatures of the company's president and secretary, and is over 16 years old. The City and Suburban Telegraph Company, later Cincinnati Bell Telephone, was officially incorporated on July 5, 1873, becoming the first company in the city to provide direct communication between the city`s homes and businesses. Manufacturer and philanthropist Andrew Erkenbrecher became the company`s first president in 1874. Rates were fixed at $300 a year for one line not more than a mile in length. By mid-1877, when the telephone was first demonstrated in Cincinnati, the Association was maintaining about 50 private telegraph lines between offices and plants or residences. Customers were equipped with a simple telegraph instrument and a code book, and young men who pedaled foot treadles served as operators and powered the call bells. In September 1878, the City and Suburban Association signed a contract with the Bell Telephone Company of Boston (the nation`s first telephone service and manufacturing company) for a license to furnish Bell telephone service in the Queen City area. The Association then became the exclusive agent for Bell telephones within a 25-mile radius of Cincinnati. Located at the corner of Fourth and Walnut streets downtown, Bell Telephonic Exchange was the first telephonic exchange in Ohio and the 10th in the nation. In 1879, the first telephone directory was published and the first line extended across the Suspension Bridge to Covington, Ky. Women, or "hello girls" who had to memorize all callers` names, took the place of men as operators, and 25 employees served more than 1,000 customers. A total of 145,392 calls had been recorded for the year. 1883: City and Suburban first contracted with American Bell (AT&T) for long-distance service (long distance being about a 100-mile radius). 1891: the first underground cable was installed. 1903: the company name was changed to Cincinnati and Suburban Bell Telephone. 1904: coin-operated telephones arrived in Cincinnati. The first street phone was between Walnut and Main on Fifth Street. 1909: the company bought its first automobile -- a major technological advance insofar as making repairs. 1913: a new headquarters building was completed on Fourth Street between Main and Sycamore. 1915: transcontinental calls became possible. 1928: a cable to Covington was laid on the bottom of the Ohio River. 1930: conversion to dial service started; it was completed after World War II. 1931: the company opened its building at Seventh and Elm streets, the "Telephone Building" in the public`s mind, which also housed the world`s longest straight switchboard, with 88 operator positions. 1946: mobile telephones were first introduced. 1952: the conversion to dial service was completed in 1952. Cincinnati was the first of the Bell companies to become 100 percent dial. 1968: electronic switching and musical beeps took over. Prosaic numbers already had replaced the traditional names of the various exchanges. Dropping Canal, Avon, East, Central, Walnut, Beechmont, Redwood, Main, Grandview and the rest was one of the telephone company`s major public relations headaches, but expanding usage and services dictated beeps and numerals. 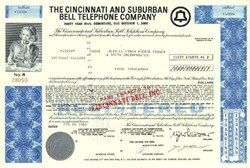 1971: the company`s name changes to Cincinnati Bell. 1976: a larger new building at Seventh and Plum was joined to the older "Telephone Building" at Seventh and Elm. 1981: headquarters moved from Fourth Street at Hammond Alley next door into the new Atrium One, where Cincinnati Bell remains as the principal tenant. A year later, the old headquarters building was razed to make way for Atrium Two. 1983: Cincinnati Bell was reorganized as a holding company to permit entry into diversified ventures beyond the core local telephone services. 1995: the "Telephone Building" at Seventh and Elm is added to the National Register of Historic Places. Today: Cincinnati Bell Telephone provides modern telecommunications products and services in a three-state area, including portions of Ohio, Kentucky and Indiana and covering more than 2,400 square miles. Broadwing Inc. became the new name in November 1999 after Cincinnati Bell Inc. acquired IXC Communications, Inc.